This book was ok but I don’t think it is the best I have read. However, I did like the main character Macie Cornwall and I think the history in the book is quite realistic – although it doesn’t make me want to find out more about history. The cover of the book makes it look interesting but I thought the story wasn’t very adventurous and it was boring. I did not enjoy the book as it did not catch me when I was reading it. I did not enjoy the story even though I had thought I would but it just didn’t interest me despite the fact I like that period in time. I would recommend it for 8-10 year olds. I have read The Mice of the Round Table- A tail of Camelot by Julie Leung which I have thoroughly enjoyed. The book is packed with magic, adventure and legend. This is the first book of hers in a series which gave me quite a good idea of what epic adventures Calib Christopher will take on. The story begins beneath the creaky floorboards of Camelot where nobody would have suspected a big adventure would take place. It revolves around the historic magical kingdom of Camelot where King Arthur ruled. There are a range of different characters- all varying from behaviour and appearance - which includes Calib Christopher, a page, Commander Yvers, Commander Kensington and Cecil who is Calib’s friend in the adventures and quests. These are just some of the variety of characters comprised in the book. As the book is set in Camelot, a lot of knights of the Round Table are mentioned. However, King Arthur is scarcely mentioned. The plot is intriguing and enthralling as it absorbs and captivates the reader fully. For years, the Mice of the Round Table have lived below the Royal Court, defending the castle they call home. Calib Christopher has always dreamed of becoming a knight and hopes he will live up to his destiny. Then, on the night of the annual Harvest Tournament, tragedy strikes as Commander Yvers gets murdered by an unknown creature. A two-bit tooth is found in his armour and apparently a page feels a bushy tail rub against him. The tournament is stopped as the most respected Commander- also Calib’s grandfather- dies. After that, commotion enters the doorways of Camelot and so do rumours. Calib and Cecily set off on a quest to discover the truth and fight that evil that threatens them. I have learnt through this book, which is set in a historic time, that Sir Kay, who was King Arthur’s foster brother, had a son called Galahad who took out the sword of the stone. I didn’t know that the tradition carried on of taking the sword out of the stone. Also, I didn’t know that the sword ended up back in the stone as I thought King Arthur had battle and the sword disappeared. At the same time, King Arthur went on a boat which carried him away. I would strongly recommend this book to who wants to find out information about that era in history while having it in a story. This is a good way to present the facts in a fiction book. In age interests, I would recommend this book to children over the age of seven. The illustrations were helpful and detailed so that you can visualise the story however the vocabulary was strong and powerful for another way to visualise the story. I would rate this book 5 out of 5 because of the plot, illustrations and the context. I have loved this book thoroughly and would like to send the word around because for a first book it is hard but this book was amazing! 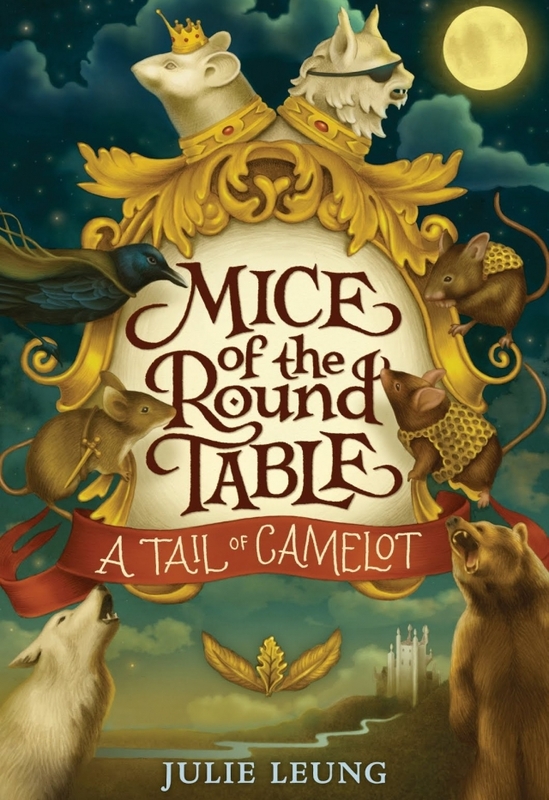 I have read The mice of the round table: A tail of Camelot by Julie Leung and I really enjoyed it. This book is packed with epic adventure, magic, mysteries and lot’s more! The characters and setting are very descriptive with lots of powerful language and are very suitable for the themes. The book is about a brave and young mouse named Calib Christopher who dreams of becoming a knight and hopes he will fulfil his destiny. But on the night of the harvest tournament, someone mysterious murders someone very important and Calib sets out on a quest to fight the evil and discover the truth to all the mysteries in his life. Also, the book is the first in the series so it gives me a quite good idea of the other adventures Calib Christopher is going to face! I learnt that not only humans fought the Anglo - Saxons but animals fought as well. I would personally recommend this book to children who love mystery and adventure as well as a bit of history. I would rate it a 5-star book because it was amazing!!!! The history in the book was very realistic because it felt like whatever was happening to the humans was happening to the mice, although sometimes in a slightly different way! This book made me want to learn more about King Arthur and his round table, and it made me want to read more books by Julia Leung. I especially liked how lots of people, and mice, achieve their dreams. This is a really good book. It is about a young mouse called Calib who wants to become a great knight. When he gets entered into the knight competition by the show-off Warren, he is worried. On the day of the tournament, Calib his friend Devrin and Warren, go into to the great hall. When it is Calib’s turn, the lights turn out and Calib’s grandfather gets killed and Calib and his friends have to solve the mystery. My favourite character is Devrin because she is a great knight and I really like it when girls are really good at things that boys mainly do. I think this is realistic because King Arthur was an actual historical figure. I enjoyed the book very very much!. I liked the main character Caleb ( who's a mouse) because he was very brave and adventurous and clever and those are the kind of books I like. I thought the book was in between realistic and not realistic (fantasy). . I liked how they were monks at the beginning. It makes me want to read more of those types of books. King Arthur was going to move away before the battle because they were a bit scared! There wasn't a single bit that I didn't like I do like adventurous stuff so it's my kind of book. This is an amazing book because it takes you back into the past into the world of knights and castles and king Arthur but from the point of view of mice! They live under the table! It’s funny, fast paced and interesting. We are learning about castles and knights so this book really suited me and helped me learn more about this period in time. This book is about mice who defend the royal castle of King Arthur. It’s their home too. Calib, the main character, dreams of becoming a knight and as he helps defend the castle his dreams start to become a reality but there are a few mishaps along the way. I enjoyed this book because we are learning about King Arthur and the Knights of the Round Table so I could tellthe others in my class some of the things that I had found out in the story too. It was also very funny in places and full of action. My friend is reading this now and my other friend is waiting for it! I particularly liked when the main character (Calib) saw the wolf because it described the fear and you really felt what he was feeling. I liked the book because it hooks you in and makes you want to read on about the mice and the adventures. Also the treacherous twists where good because you weren't expecting them. Some of the history in the book was realistic, like Camelot and king Arthur but merlin was not real and mice cannot talk. I would want to know about the real history so I could really understand the book and know more about those times. I would not like to read any more books by this author because near to the end it became boring and there were no twists so you could plan what was going to happen. I enjoyed the mice because they were brave and had you on the edge of your seat about what was going to happen to them. I really enjoyed reading this book because it had adventure and it was about a mouse called Calib sets of on a quest to discover the truth while evil threatens them. Â This book was about a mouse that has to defend the castle at the start but Calib dreamed of being a knight and not stuck under the castle guarding. The setting is in the mountains with a castle on top that has a royal bridge connecting to a forest of full of dark green trees that shake when wind appears. I would totally recommend this to others, especially if you enjoy adventure and magic. I like this book because its an adventure book and I like them. The place in the story that I liked the most was the Goldenwood Hall because its where the harvest tournament was placed, also I liked the character, Howell the wolf. My favourite event in the story was when Calib and Cecily went to see the owls who were holding Merlin's crystal. I don't think the history in the book is real because its about Mice who fight and explore to find stuff like an owls feather just to get some owls to listen to them. The book made me want to read more books by this author. The main characters were Calib and Cecily.